alaTest ha raccolto ed analizzato 15 recensioni su Braun 5875 Contour. La media della valutazione per questo prodotto è 3.8/5, confrontata con la media della valutazione di 4.3/5 per altri prodotti. Abbiamo analizzato differenti valutazioni di esperti ed utenti, età del prodotto ed altri elementi. A confronto con altri prodotti, Braun 5875 Contour ha ottenuto un alaScore™ complessivo di 78/100 = qualità Buono. The on/off switch could be the other side ( if you are right handed that is. It is awkward to switch on and off. 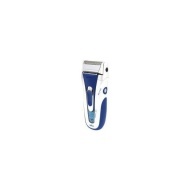 nice design solidly built shaves well in difficult stubble Quiet quick charge or mains. not the closest electric shave I have had. Not very efficient at actually shaving - long hair trimmer is practically useless. I've been using Braun shavers for over 25 years and this is the first time I've ever had one that I was not satisfied with. Heavy. Slow shave and not very close. Easy to use, does not leave stray long hairs like other foil razors. Shaves up to a straight line beard edge. Low charge warning adequate for reqirements. Like most electric razors necessitates shaving twice a day - morning for work - evening if "going out".